Artist and bone enthusiast Amy Karle at Pier 9 in San Francisco collaborated with scientists to grow a human hand, which is now on display. 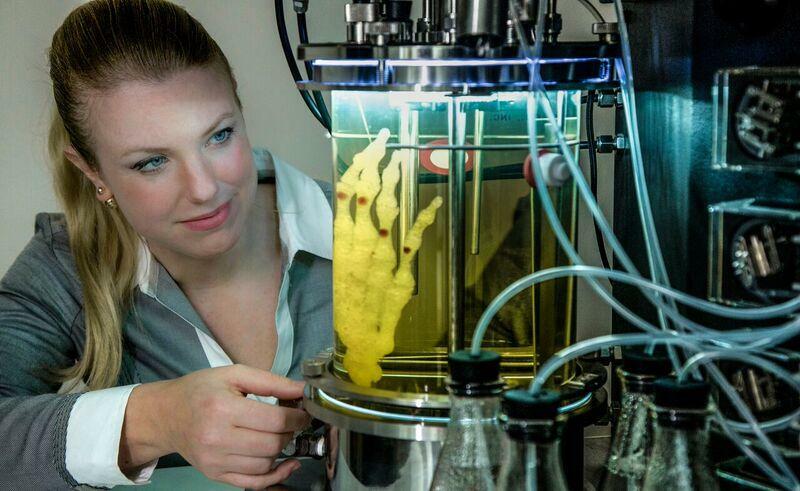 Here’s an interesting project: somebody has been growing a human hand in a lab and displaying it for the world to see. We live in a time where the meaning of impossible needs to be updated. As we make new discoveries, new possibilities open up to us. And if you want a good example of that, just look at how advanced prosthetics have become in the last decade. Soon, you might be able to grow a human hand like a Chia pet. Or take a look at Dr. Sergio Canavero, who plans to perform a full-on head transplant later this year. But that example may be a little extreme. See, there’s something miraculous about giving something vital like a limb or an organ to someone to needs it. In the past, it couldn’t be done, but with the future in sight, we’re slowly changing our minds on that. So, the future can be full of hope. And when one of us loses a hand, possibly due to someone we have only just learned is our father, we won’t have to worry too hard. Ok, here’s a better example of the kind of future I’m talking about. Artist Amy Karle has an interesting new project that combines 3D printing with stem cell research. The idea is to grow a functional human hand, and if it works she wants to make the design free and open source. And trust me, that will be one weird-yet-cool day for the people who frequent Instructables.com. Karle may be an artist, but she’s no amateur. She works with nonprofit groups that design 3D printed prosthetic arms, and she has help from a team of scientists. The project is called “Regenerative Reliquary“, and it is being displayed in San Francisco’s Pier 9 space while it grows. Or, to be more accurate, while part of it grows. Karle has designed a 3D printed trellis in CAD which was printed using a cellular growth medium called pegda. Over several weeks, the pegda trellis was grown in a bioreactor on display. The next step will be to grow a cell line on the trellis, something Karle is culturing stem cells for now. The team is using stem cells extracted from bone marrow, and with any luck, the idea will bear fruit and be released to the public. I like the sound of an open source prosthetic design, especially considering how much more of an option 3D printing is these days. Lose a limb, and you may one day be able to make a replacement within the comfort of your own garage. Now you know how Karle plans to grow a human hand. Let’s rewind a bit, back to where I mentioned Dr. Canavero and his upcoming head transplant. As crazy as it sounds, if Canavero’s plan works science will have taken a big step toward manipulating the central nervous system. And that’s really, really important. If scientists can connect a head to a spine, and they can grow a limb in a tank, it follows that they may one day be able to attach that limb as a replacement. And that doesn’t just apply to limbs, either. Scientists have been looking into growing replacement organs for years, just look at this article from way back in 2014. We may be on the verge of the ability to reproduce and replace parts of the human body. And at this rate, who knows what kind of effect this can have on the survivability rate of human beings in the future. I’m sure we’ll never resurrect the dead or anything, but I think the fictional Dr. Frankenstein would be proud. Creating replacement body parts is something that has been a mainstay of science fiction, and it isn’t crazy any longer to think that it may become a reality. So, like I said earlier, we may need to push the goal posts back on the word ‘impossible’. Should we even learn how to grow a human hand? Will the future of transplants be grown in a lab, or will we find some other way to replace our limbs and organs?